Conor McGregor will be taking on Rafael Dos Anjos for the UFC lightweight title on Saturday, 05 March 2016 in Las Vegas, USA. It will be the second consecutive title fight for Irish fighter Conor McGregor who is coming into this fight on the back of winning featherweight title from Jose Aldo in a 13 second knockout in late 2015. 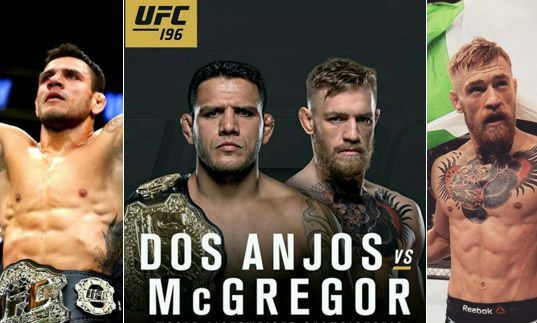 Rafael Dos Anjos will be defending his lightweight title and stop McGregor from becoming champion in two weight-classes all this will be part of UFC 196 pay per view which is co-featured by Holly Holms vs Misha Tate. McGregor vs Dos Anjos Purse Payouts: Conor McGregor made a lot of fuzz in 2015 having been the top draw in UFC and he made around $7 million from his 13 seconds win over Jose Aldo. As far as the UFC 196 is concerned he is tipped to make around $10 million from this fight. Both fighters fight night purse is $500,000 guaranteed while another $100,000 as winning bonus but both fighters will be making alot more than that with their unique PPV tier based contracts with UFC. McGregor has been the top draw in UFC making 2015 the best year for the company since 2010 as far as PPV buys are concerned. His fight against Mendes in UFC 194 did around 825,000 ppv buys while his title bout against Aldo broke PPV record with over a million buys (not confirmed yet) earning him around $7 million from that fight. So how much will McGregor earns from his next fight depends alot on UFC 196 PPV buys, if they were to cross $1.5 million mark he will become the first UFC fighter to earn $10 million from a fight. Conor McGregor $500,000 $100,000 McGregor has a PPV share (tier based) contract with UFC where he earns $3/$5 for every PPV buy depending on the final numbers. If UFC 196 were to do 1 million buys he is set to clear around $10 million from this fight.